Did you see Unity’s NEW month long challenge? We’ve simplified it down to just ONE beautiful theme… FULL of possibilities. I have two projects to share base on the ANY HOLIDAY challenge for this month. What perfect timing for this challenge!!! I don’t know about you, but I’m cranking out some Christmas cards this week!!! I really need to get them in the mail! Eeek. So, I’m using this cutie. Awwww… I just want to squeeze him in his adorable snowflake sweatshirt. I stamped this little owlie on white cardstock and colored him with Copic markers. At the end, I added some glitter glue for a little sparkle. I turned my video camera on while I colored in case you’d like to watch. With each new challenge, we also release a new sentiment kit. 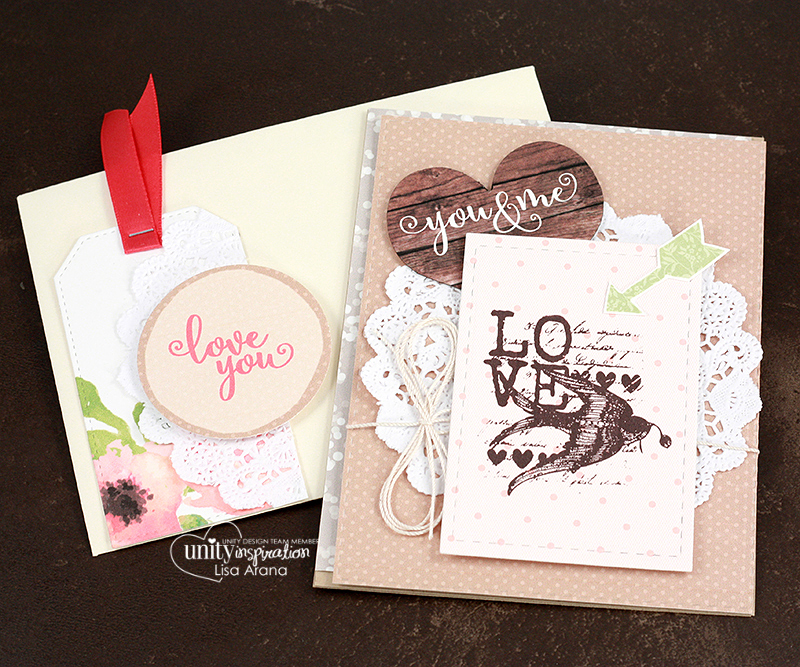 This month’s kit is full of love images and sentiments. Now, it may not be a Christmas holiday, but Valentine’s Day is a HOLIDAY, soooooo… it would qualify for the challenge as well. Heehee. So romantic… I went with a vintage, romantic them for these cards. I was playing around with some leftovers and created a tag to go with my card. Figuring it could be added to a gift or to the front of an envelope. Don’t forget to leave a comment on each blog today and hop with us. Here is the list of all the hoppers with the design team up first. I love this card! Seriously! And the Valentine’s cards are adorable too. The owl is darling! I love his warm sweater and you colored him so beautifully! The romantic / vintage cards are sweet! I’m sure anyone would love to receive one on Valentine’s day! Your owl card is adorable. Whoever gets that card is going to be very happy. So cute. Love both the cards very beautiful. I love this owl stamp…so happy I have him too. The owl is darn cute! Your designs are always inspirational, love both of them! The owl is really cute and your colors are so bright!!! Your cards are great! This is fun thanks! Beautiful cards. Love the sentiment kit. This little owl is just too darned cute! Thanks for the video! Made me smile, what a cutie patootie! Wonderful cards! Love the cute owl image! Such pretty layers and embellishments! love, love, love your cute cards!